What did Diana present with? She is presenting with soreness, tightness and tenderness in her calves, more in her right foot where her surgery was preformed regarding the Haglund’s deformity. She also showed pain underneath her feet. Her right knee also flares up daily and was hot to the touch. History: Diana had surgery on her right heel where she had plates and screws put in which was a result of her Hagley’s deformity. She also suffered from bone spurs off her heels as well. Diana has high arched feet which is a risk factor for calf pain, Haglund’s deformity, bone spurs and plantarfasciitis. After surgery Diana has had no therapy done on her ankle or legs but says the surgery had been a massive success. She has been thinking of getting treatment for a while now, and saw that the therapists at Revolution can help. Procedures/ Treatments: My treatments were based on releasing tension and tightness in her gastrocnemius, soleus and calcaneal tendon (Achilles). I did this through myofascial release, trigger point therapy, deep and soft tissue techniques and kinesiology taping. 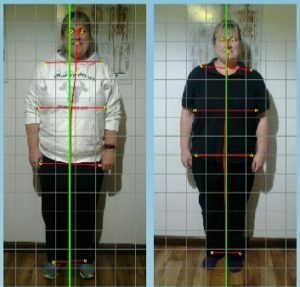 Treatment one; I did a postural assessment on Diana, through my assessment I noticed she locks her knees, and in a result, she anteriorly tilts her pelvis. Range of motion testing I found out all movement was optimal with her knees. Her ankles moved quite well but swelling limited them slightly. 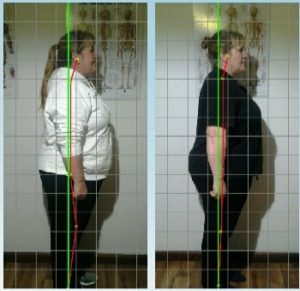 I also tested her hips and in a result her left hip could only flex it to 70 degrees. I then did treatment on her posterior legs and tibialis anterior. A week later Diana came in for her next treatment and she noticed she could walk better on her right ankle and pain had decreased. She did complain about her right knee that day saying it gets sore when standing for long periods (gets tired), she told me that the doctors have told her it needs a clean out and some surgical work done on it. From this information I thought I would treat the quads as well, to release some tension from the knee joint. I continued the same posterior leg treatment and added in the quadricep treatment where I performed myofascial release and deep tissue massage techniques. Next treatment Diana informed me that she still hasn’t had any pain in her right ankle or left foot. But the right knee was still painful, so this time I stuck with my treatment, but I added in some kinesiology taping for the knee. Her next two treatments we noticed that the ankles and feet were still good, but the knee was the same, but the length with standing on it was increased and it didn’t get as sore as it would with the tape on. I also noticed the swelling around Diana’s right ankle (from the surgery) had been decreasing from each treatment. Results: The results we gained from this case study was a decrease in pain in Diana’s right ankle and an increase in walking productivity. We gained a decrease in swelling in her right ankle as well. Through treatment of the quadriceps, Diana was able to flex her left hip to 90 degrees again with no pain. Treatment Plan: My treatment plan for Diana now is to get her to continually stretch her calves and roll trigger ball underneath her foot if plantafascia symptoms come back. Also, to keep taping her right knee, as she gets good relief from it. As well as taping the knee, I’ve got Diana icing the knee if it continues to get sore or has a bad flair-up. I also have Diana coming in for regular treatments every 3 weeks to work on her posture. Conclusion: Through the treatments and procedures,we were able to get Diana’s foot and ankle pain to decrease. This was able to happen by releasing tightness and tension in her calves and Achilles, the decrease in swelling was also a huge help in completing this. This case study was successful in treating Diana’s Plantarfasciitis, Haglund’s Deformity and posture.